Find My Workspace lists over 95% of the business centres market in Tamworth. Simply click Request Quote to check pricing for one office, or Add to Basket for multiple offices. 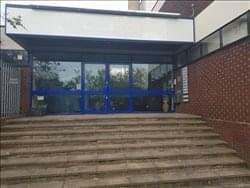 This centre comprises of a mix of both serviced offices and industrial units. Boasting 10 serviced offices with sizes ranging from 148sq.ft to 526sq.ft, this centre benefits from a range of amenities. Tenants will have access to a number of meeting rooms, a communal kitchen and 24-hour a day security. There are also 6 light industrial units available within this centre, ranging from 100 to 2269sq.ft. All of these units are self-contained and benefit from 3 phase electricity, kitchen facilities and parking available. This secure centre is an ideal place for businesses to set up a regional office, or for start-ups to establish themselves.